1. Model fluent reading. It’s important for your child to hear the rhythm of proper fluency. Read out loud to your child regularly and be sure to include expression and animation. You can even try books on tape for additional fluency modeling, or create a family event by having an older child read out loud to a younger child. Make it a fun activity, with different voices, narration, and cheerful expression. 2. Choral reading. Further enhance reading aloud with multi-step choral reading. To perform this process, select a passage or page from a book. Have your child read the selection out loud as a cold read. Then you read the same passage aloud to your child to model fluent reading. Next, have your child read the passage together with you, maintaining the same pace. Finally, have her read it again aloud on her own for a final read. Give her positive reinforcement and encouragement by recognizing the difference in her fluency between the first read and the final read. 3. Sight words. While certain words are decodable (meaning they can be sounded out), others, called sight words, cannot be sounded out and must be memorized. Some example of sight words include: these, where, and how. It is important for students to have a fund of sight words memorized in order to make reading a more fluent process. Try printing a list of grade-appropriate sight words (also called dulch words). Make flash cards with the words and hang them on a wall, have your child draw the letters from each word in sand, or play games, like Sight Word Bingo or Sight Word Tic-Tac-Toe for extra reinforcement. 4. Word-per-minute timings. Create a list of words on a page (sight words work well!) and time your child for one minute to see how many words he can read. Create a word-per-minute timing log and maintain a record of the number of words your child was able to read from that list in one minute. Try 2-3 timings of a given list, and give your child a sticker or small reward for beating his time. You can also try word-per-minute timings with phrases and stories. 5. Repeated reading. Encourage your child to find a grade-appropriate book that she enjoys reading. Have her to read that same book over and over again, since repeated reading improves fluency. She will also become a more confident reader and will learn to add expression and proper intonation when reading. Reading fluently is a challenge for many children. 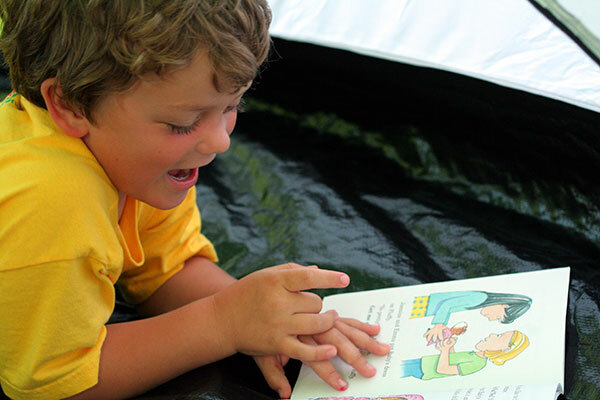 Yet with practice and repetition – and use of the strategies above – your child will learn to read with more expression, joy and, ultimately, better fluency.